Back in the day, we never asked, is peanut butter healthy, peanut butter dominated grocery shelf space as the king of our favorite spread for our beloved peanut butter and jelly sandwiches. Today, a walk down the “peanut butter” aisle has turned into a Niagara of nuts that have been churned and pulverized into tasty spreads rivaling our adored peanut butter. Peanut butter does have competition but the trendiness of trying out various nut butters packed with health perks is good news for us. These nutty spreads pack a powerful wallop from lowering bad cholesterol to aiding in weight loss. Nut butters are an exceptional way to get in necessary nutrients promoting our health. They’re a unique and versatile method of obtaining the healthy fats many of us may not be eating from our food choices. Each variety offers something a little different and all are beneficial in their own way. One of their best assets is the fat composition they contain. The butters tend to be rich in both monounsaturated and polyunsaturated fatty acids which are known to reduce LDL cholesterol and triglycerides. This helps lower the risk of metabolic syndrome, heart disease, and type 2 diabetes. Eating a nut butter sandwich is a far better choice to choose versus eating a prime rib steak loaded with unhealthy saturated fat. The healthy fats found in nut butters lead to a greater feeling of satiation keeping us feeling fuller longer than eating a handful of pretzels. In fact, a study from the Harvard School of Public Health found regular nut consumption to be associated with a slightly lower risk of weight gain and obesity. Another study found weight and waist measurement hardly changed among people who consumed normal vs a nut-supplemented diet. Many of us regard peanut butter as a symbol of our youth. Botanically, peanuts are actually a legume but they tend to get lumped in and are associated with nuts. So is peanut butter healthy? Peanuts have many health advantages we can use. A study found that peanuts may possibly increase our metabolic rate. Test participants who consumed 505 calories of peanuts daily for 19 weeks saw their resting metabolic rate increase by 11% even without exercise. If you’re looking for a good protein source, peanut butter is your answer. Peanuts contain one of the highest amounts of protein per serving among nuts and seeds – they contain 7 grams of protein in a two tablespoon serving putting peanut butter at the top of nuts providing protein. Almonds are one of the most nutrient-dense tree nuts you can find which has made almond butter a favorite one to try. One ounce of almonds contains about 50% of the daily value for vitamin E which can possibly lower the risk of heart disease and the antioxidant works to support healthy skin and hair. Per serving, almond butter has one of the least amount of calories and the most fiber of all the nut butters with 3 grams in a 2 tablespoon serving. This creamy spread also contains a significant amount of calcium, magnesium, potassium, phosphorous, and iron. This butter is at the top of the nut butter list for having the highest amount of heart healthy omega-3 fatty acids. Omega-3 fatty acids have anti-inflammatory properties important for those suffering from inflammatory and autoimmune diseases such as Crohn’s disease, lupus, multiple sclerosis, and rheumatoid arthritis. Looking for a nut butter to have a positive impact on blood glucose levels? Pistachio butter is a good start. A 20ll study published in the European Journal of Clinical Nutrition found that consuming 2 ounces of pistachios along with high-carbohydrate foods significantly reduced blood glucose spikes. Eating pistachios is also associated with cardiovascular health as it has been found to lower bad LDL cholesterol and triglycerides while increasing good HDL cholesterol. Another key nutrient pistachios possess is the antioxidant lutein. Lutein is known to protect against free radical oxidation of LDL cholesterol important for reducing inflammation and arterial plaque buildup. Try dipping apple slices into pistachio butter for an excellent source of copper and vitamin B6, manganese, phosphorus, and thiamin. LEARN MORE: What Type of Milk is Best? Want to build stronger bones? Try cashew butter. This magnesium-rich nut butter is full of nutrients that will boost bone health. One tablespoon of cashew butter provides 10 percent of the daily amount recommended for magnesium which is also important for neurological, metabolic and immune functions. In addition, magnesium helps maintain steady heart rhythms, normal blood pressure, and stabilizes blood sugar levels. It has a light flavor and a sweeter after-taste than other nut butters and is perfect for dipping in fruits, veggies or to spread on toast. First, there is no such thing as a soynut – they come from soybeans, a member of the legume family just like peanuts. But soynut butter has a very similar nut-like flavor and appearance to peanut butter and for those with peanut allergies but like the taste of peanut butter, this is a good substitute. Soynut butter has the same amount of protein as peanut butter – 7 grams in 2 tablespoons – but with less fat and calories per serving compared to peanut butter. 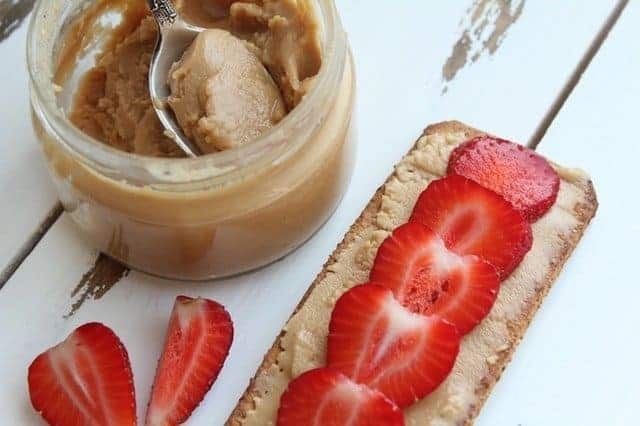 Two tablespoons of soynut butter has 14 grams of fat, 2.5 grams saturated fat and 190 calories while peanut butter has 17 grams of fat, 3 grams saturated fat and 210 calories in the same serving size. Soy contains plant compounds that peanuts do not – isoflavones. Isoflavones are the substances in soy that may help prevent chronic diseases such as heart disease, kidney disease, prostate and breast cancer, and osteoporosis.